We’ve been chasing arms dealers wherever they seek to do business. Now it’s time to party! When tackling the systems that perpetuate conflict, repression and inequality, change doesn’t come quickly, so it’s important to remind ourselves of our achievements along the way. 2013 was a brilliant year for anti-arms trade activism: Arms trade networking events were challenged wherever they took place; a wide range of groups took part in an amazing week of action against the world’s largest arms fair, and people took part in solidarity actions with communities impacted by conflict and state repression. We’ve picked an action for each month of the year. Many more actions happened across the UK and the world, and it would be great to hear about them. Let us know your favourite action by adding it to the comments section below, or share it with us on Facebook or Twitter. Activists infiltrated a dinner at the Hilton in London, distributed leaflets and talked to guests, getting the year off to a great start. Disarm Leeds used creativity and direct action to put the arms trade under pressure on campus. February saw the first actions in a great campaign by Disarm Leeds which won a vote to ban BAE Systems from campus and urges the university to end any financial ties with the arms company. Just one of many impressive student actions against the arms trade this year. On 15 April, 155 actions in 124 cities and towns in 24 countries took place to mark the Global Day of Action against Military Spending. Actions included vigils, die-ins, marches, concerts, panel discussions and even a ‘pacific teletubbies’ video. In London, activists delivered a performace of ‘Play the Budget Right’ outside parliament, getting participants to choose between funding public services like health and education, or trident. Protesters “completely overwhelmed” the Annual General Meeting of BAE Systems, the world’s third largest arms company. During the G8, people went on a mission to find all the arms dealers in London. After meeting at BAE Systems, the 150 strong crowd paid a visit to Thales, Lockheed Martin, Northrop Grumman UK, missile company MBDA and Qinetic. Activists disrupted a breakfast briefing for arms dealers, hosted by London Chamber of Commerce and Industry (LCCI) Activists managed to block the entrances for half an hour, when the event was only an hour long! At the end of August, activists set up a disarmament camp at Burghfield atomic weapons establishment. The two week camp was organised by Trident Ploughshares and Action AWE and was an opportunity for people to share skills and plan for an international mass action on 2 September. The world’s biggest arms fair took place in East London from 9-13 September and hosted 1500 arms companies and 30,000 arms buyers and sellers. The UK government’s invite list was a roll call of authoritarian regimes and human rights abusers. But the fair was challenged by daily direct action disrupting and blockading its business. Watch the video here. 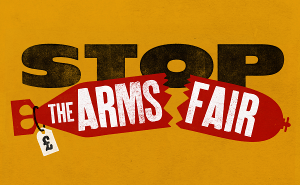 Several activists are facing trial for taking action at the arms fair. Follow the court cases and send them a message of support here. A global campaign was launched to stop the flow of tear gas to Bahrain, after research and advocacy group Bahrain Watch published a leaked official document showing that the government may be planning to import 1.6 million tear gas canisters and 90,000 tear gas and sound grenades. Actions took place in London and South Korea. Meanwhile in Seoul, the ADEX arms fair was taking place but not without creative and bold actions taken by peace campaigners, some of it inspired by the actions that had taken place at DSEI less than two months earlier. Arms companies attempting to attend the ‘Defence, Procurement, Research, Technology and Exportation’ event were greeted by queues trailing back along the A4174 as protesters blocked the UWE North Entrance. One gate was eventually locked and attendees forced to use other entrances. Trident Ploughshares wished Lockheed Martin a merry christmas with carols and requested they use their skills for peace and not nuclear weapons. It would be great to hear your stories and highlights of the year. Here’s to feeling inspired and energised for taking on the arms trade in the new year!